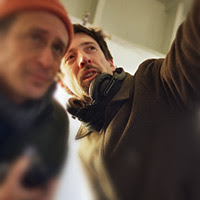 John Helde is a director of documentaries, feature films and commercials. He got his start with the New York documentary-makers Maysles Films, and was a film editor on movies by such noted directors as Alan Rudolph, Steve James, and Chris Eyre. John’s debut feature documentary MADE IN CHINA played the festival circuit to critical acclaim and launched on the Documentary Channel. His award-winning dramatic shorts include HELLO, starring Eric Stoltz and Susanna Thompson, which won the CSA Artios Award for Best Short Film Casting. John’s documentary FIELD WORK: A FAMILY FARM, which Willamette Week called “like all things truly American, both celebration and elegy,” is on public television. His 2015 feature PHOEBE’S FATHER, about a young woman cyclist confronting her past, premiered at NYC Independent Film Festival. John also directs award-winning brand films and commercials for clients including Microsoft, Alaska Airlines, WongDoody, and Partners for Our Children. He is finishing post-production on his new feature BROWN’S CANYON and is developing the comedy/drama OPEN DOORS.